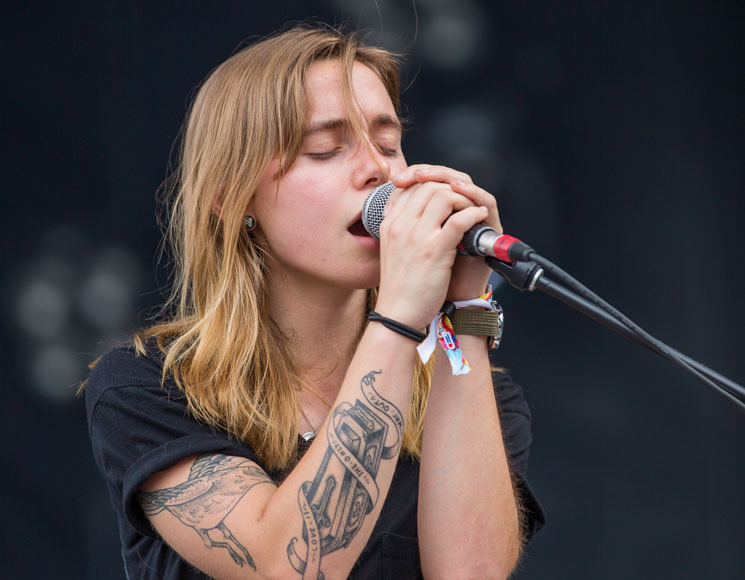 Known for her spare acoustic and piano-driven odes to heartache in all its forms, Julien Baker's pop-rock-trained voice is soaring, defiant, filled with a chill-inducing sense of catharsis that other musicians could only dream of mastering. Touring in promotion of her critically-acclaimed LP, Turn Out the Lights, the Tennessee native took to the tree stage yesterday afternoon and sat in front her keyboard like someone about to give a eulogy. Not that she looked upset in any way — more that she was preparing herself to deliver another vulnerable performance to a crowd full of strangers. Joined by a violin player for a handful of songs, Baker spent most of her short set on the stage alone with her keyboard and powder-blue guitar with rainbow-coloured strap. Moving through "Televangelist" and then "Appointments," hitting every note, she then followed up with older songs like "Rejoice," which unfortunately ran into a couple of technical issues, like a dead mic that breathed itself back to life halfway through the following song. Slightly frustrated, Baker continued on with "Shadowboxing" to deserving screams and applause. Ending her short set with "Sour Breath," screaming out the lyrics "the harder I swim / the faster I sink," Baker ended her great, albeit technically hindered set with a victorious smile.